BCF Ultrasound are supporting the ANZCVS Veterinary Anaesthesia & Analgesia Chapter’s upcoming workshop on ultrasound-guided local anaesthesia. This is the first workshop of its’ kind to be held in Australia and is open to all veterinary practitioners. So how can these techniques help you in practice? We recently spent time with small animal veterinary surgeon, Dr Andrew Jacotine in Melbourne to find out how he encorporates ultrasound-guided nerve blocks into his patient management. Dr Jacotine performs advanced procedures such as TPLO, minimally invasive fracture repair and laparoscopy on a daily basis. He started using regional nerve blocks in his surgery patients over 4 years ago to improve patient outcomes. In the last year, he has switched from using blind techniques to using ultrasound guidance from his Mindray M9. Ultrasound-guided nerve blocks have become part and parcel of his daily work and he performs a minimum of 10 ultrasound-guided nerve blocks per week. 95% of the blocks are for hindlimb procedures (e.g. TPLO, CBLO) and the remainder are for forelimb surgeries (e.g. fracture repair). Ultrasound guidance has allowed Dr Jacotine to use less local anaesthetic and yet achieve more consistent results. He also notes that he achieves the same level of pain control as epidural analgesia, but without the side effects (e.g. subdural haematoma, bladder issues, immobility). 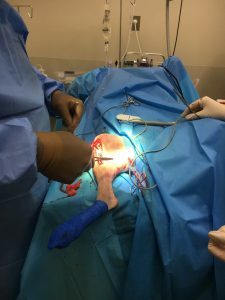 All in all, these techniques allow his patients to make a speedier recovery and reduce the level of post-operative nursing care that they require.